According to Flickr, this is my most interesting* photo that isn’t someone in costume at a fan convention. It’s #68 on the list! 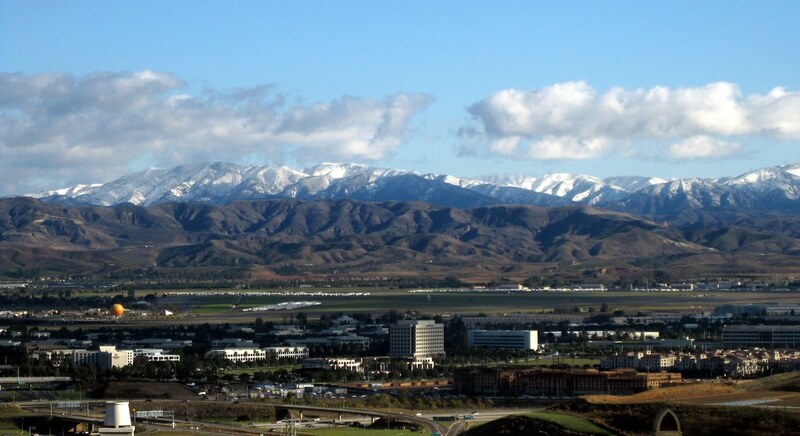 The photo was taken December 18, 2008, after a storm passed through Orange County and did something unusual: it blanketed the Santa Ana Mountains with snow. Saddleback typically gets a light dusting a couple of times a year, and the next peak down sometimes gets a little snow that melts by noon, but it’s rare for the snow to reach any lower. The vantage point is a housing development on Quail Hill, looking southeast over the Irvine Spectrum area. You can see the Great Park Balloon near the left. Saddleback itself is out of frame to the right, but you can see its base (the peaks are covered in clouds) in the panorama I shot at the same time. *Flickr’s “interestingness” is a measure that combines a count of views, comments, and “favorites.” The exact balance is secret, but from what I can tell, comments outweigh favorites, which outweigh views. Wednesday morning on my way to work, I looked over and saw the San Gabriel Mountains practically glowing with the morning light of the sun. A layer of cloud blocked the sun where I was, making the distant peaks look that much brighter. I stopped at a spot where I knew I’d have a good view of the mountain range. It turned out to be a really interesting view, as you can see from the panorama below. By lunchtime, the sky above was mostly clear, and clouds were bunched up against the mountains, completely blocking them. I was indoors most of the morning, but it seemed as if the cloud layer had just blown northward until it hit the mountains, then stopped. Click on either image to go to its Flickr page. Okay, that should do it for this week’s photos from after the storms. Next week: back to “classic” photos from my Flickr collection! Santa Ana Mountains Snow – Quail Hill View, originally uploaded by Kelson. Monday’s storm didn’t leave much snow on Saddleback (though the San Gabriel Mountains were pretty well covered), but it’s been cold enough that I half-suspect this weekend’s storm will leave a bit more. So here are a couple of views of the Santa Ana Mountains and the Irvine Spectrum from last December, seen from Quail Hill. The first was taken the morning after the storm ended. The second was taken the following day at lunchtime. I’ve also got a full panorama taken at the same time as the first photo. Santa Ana Mountains Snow – Quail Hill Revisited, originally uploaded by Kelson. 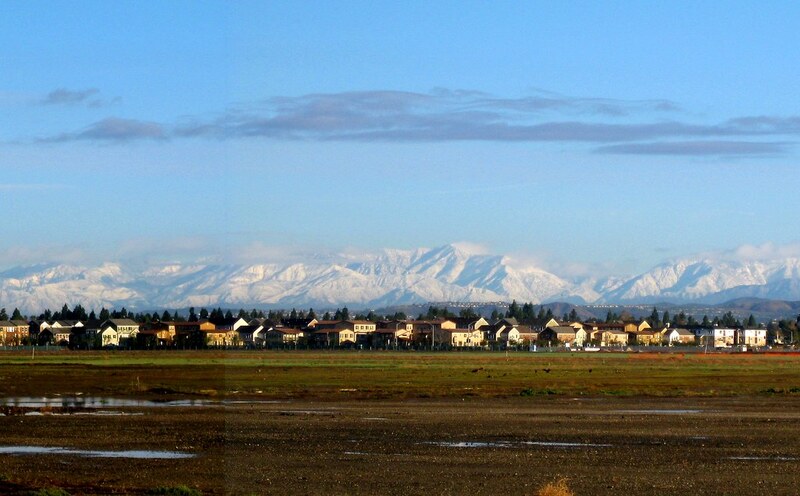 San Gabriel Snow (Section 1), originally uploaded by Kelson. I haven’t had a chance to post any of the photos I took of the mountains after Monday’s storm, so here’s one from last December. It was taken at the end of the Warner Ave. exit from Jamboree near The District on the former grounds of MCAS Tustin in Tustin, California. This is a small section of a larger panorama of the San Gabriel Mountains. Woodbridge Snow View 1, originally uploaded by Kelson. 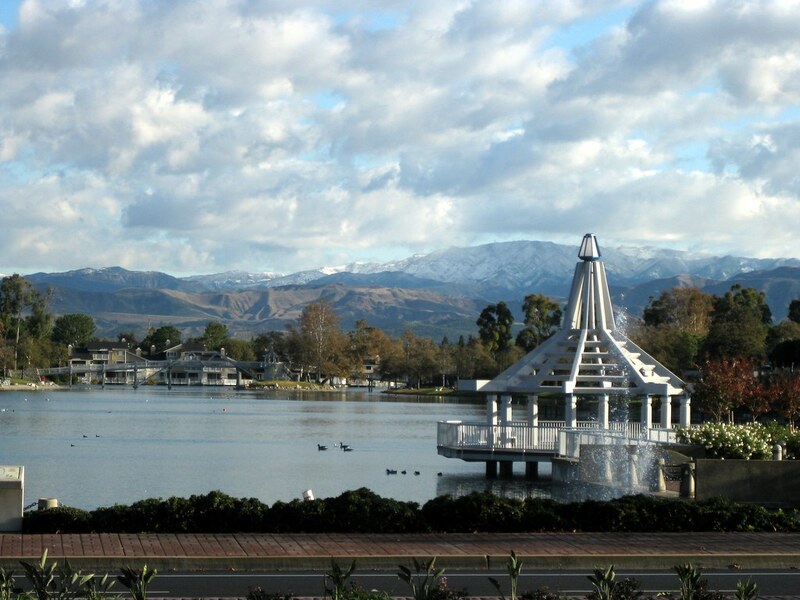 View of the Santa Ana Mountains from Irvine, with Woodbridge lake in the foreground. Taken December of last year. Amateur photo blog. Mostly scenic shots, typically in Southern California (but sometimes elsewhere). Updates weekly. Unless otherwise specified, all photos are copyright Kelson Vibber. Do not reuse without permission.